Brody Singer took one look at Abby Dunn and fell in instant lust. Abby looks a lot like a woman he once knew, one who died years ago. But is his attraction merely a holdover from a secret crush from long ago? But Abby’s definitely someone different. She’s a lot shier, a lot sexier, and despite her attempts to dissuade his interest, mesmerizing. Abby isn’t having it. She’s still trying to put her last disastrous relationship behind her and overcome the flaws her ex so kindly pointed out. She’s too short, too plump, too boring, too blah. But somehow Brody isn’t getting the picture that someone as handsome and built as he is should be with a woman far prettier. 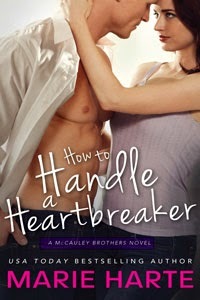 It doesn’t help that when writing her steamy books, she keeps casting Brody as the hero. Only Abby can write her own ending. She just has to decide which version to keep: the one where she shows Brody she’s a woman worth keeping and he’s a man worth loving? Or the one where she settles for a rough draft of a life, alone and safe from ever getting hurt again? I absolutely, positively agree with the message of this story —– Blood doesn’t make you a family. No, the people who care about you, are there for you through thick and thin, those are your family. Also, there is more to being a parent that sharing some DNA. Brody might not be a McCauley by birth but he is a McCauley nonetheless.